The City of Lansing Human Relations and Community Services Department and the Greater Lansing Food Bank will be distributing free, fresh and non-perishable food items. Helping Women Period will be distributing menstrual products at this event. If you or someone you know must choose between buying food, filling prescriptions or paying bills, please tell them about this important program. If you would like to volunteer for this or future events (partial shifts available), please sign up at http://bit.ly/MobileFoodBank Please note this event is OUTSIDE and will take place regardless of the weather. 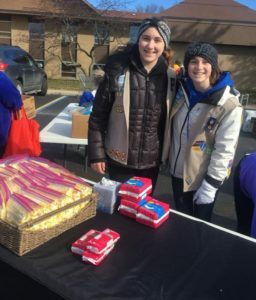 By partnering with Michco Industrial Supply, we can purchase cases of 500 pads or 500 tampons for approximately $50.00. © 2019 Helping Women Period. All Rights Reserved.